Baby it’s cold outside! So that gives us an excuse not to do our yoga practice, doesn’t it? Well…yes, kinda, but no, not really. When we are cold, our circulation decreases, which not only slows the effectiveness of the organs, it also lowers our body temperature even more. This can lead to constriction in the muscles, joints and even our perspective. 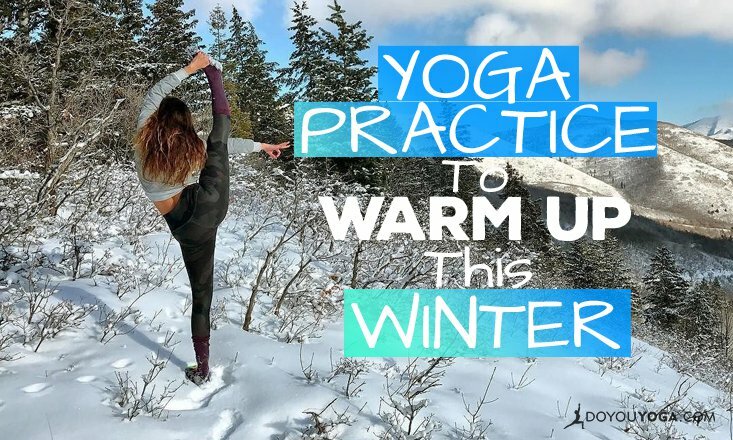 So even though it’s tempting to not move and just snuggle on the couch, the cold weather is actually all the more reason to keep up our yoga practice to develop an internal heat that keeps us healthy and warm. Just as we adapt our diet to the seasons, we learn to adapt our poses and approach to practice according to the changes throughout the year. When it’s cold outside, it’s now time to apply some methods to increase heat that may not be best during the hot summer months. If you are feeling cold in your practice space, sip a cup of hot water right before your start. That will start to warm you on the inside and you can pick up the warmth with your upcoming movement. Add some lemon if you don’t like the taste. This is a fairly safe cleansing technique that some styles of yoga view as a Pranayama practice. Sitting in a comfortable position with a very tall spine, place a hand on your lower belly, below your belly button. After receiving an inhale, exhale forcefully from the lower belly, feeling the hand quickly move towards your back body. Then do it again, without inhaling. (The inhale will happen naturally, don’t worry.) Your job is to focus on exhaling, over and over. Start with a steady pace, allowing each exhale to complete itself. As you get comfortable, this may start to move faster. After about 25 repetitions, exhale all the air out and allow a large inhale to move in, holding the breath for a few seconds, then slowly releasing it. When it starts to feel comfortable, you can repeat this cycle two more times, allowing a rested breath in between rounds. Sun Salutations are designed to cultivate heat. If you are practicing in a cool room, start slow to ensure that your body is open to the movements, breaking more complicated pieces down into simpler pieces. For example, hold Plank for 30 seconds a few times before going into Chaturanga, and do some Salabhasanas (Locust Pose) before moving into Upward Facing Dog. Once the body is comfortable with the movements, keep your Sun Salutation practice moving. If you are doing Surya A or B, consider skipping the five-breath hold in Down Dog and simply step or jump forward to finish the one you are doing, beginning the next one right away. If you are doing Surya C, just keep going. This becomes an aerobic practice when the movement of the body is linked to the breath, flowing continuously. If it feels fatiguing, substitute jumping back and forward with stepping to protect the joints. Then you can keep going for 10–20 minutes and really work up a sweat. Raising the arms upwards in line with the ears in poses is a technique that can increase heart rate and body heat. So, next time you are in Warrior Two, raise your arms towards the sky instead of stretching them horizontally. Look for other opportunities to bring the arms over your head – Tree Pose, Warrior Three, and Triangle (extend the top arm in line with your ear, parallel to the floor.) You can even raise the arms in seated forward folds. On your way towards your feet, pause before you touch your toes and keep the arms in line with your ears, elongating your spine. It will work the muscles along your spine while stretching your hamstrings, all while raising the inner temperature. Start with some abdominals. Since the body is not yet warmed up, choose abdominals that have the spine fully supported by the floor. 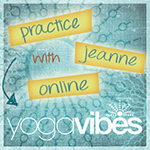 (No Navasana for the first 10–15 minutes to protect the lower back.) You can play with a variety of crunches and apply a deeper exhale, which not only helps you access the deeper muscles, but connects you to your center. Flip over onto your belly and spend some time in variations of Salabhasana, the Locust Pose. Holding this pose for 30 seconds or longer is a guarantee to increase your inner temperature. As an extra bonus, you can strengthen your diaphragm by regulating your breath, especially the inhale. Standing Twists are very heating while also toning the abdominal region, cleansing of extra residue. Consider doing one, (Twisted Triangle for example,) and then repeating it on both sides. You will go deeper and be able to hold a little longer, which can raise the internal temperature. Seated Forward Folds, often used in the cooling down part of a practice, can be seen as abdominals. Put more attention towards the belly contracting towards the back body on each exhale, instead of the lengthening of the legs. This allows the body to cool and relax, without becoming too chilly. Fanning the Fire, called Agni Sara, is a practice that almost anyone can do which not only tones the abdominal organs, it also helps kindle an internal heat. With the legs set wider than the hips, bend your knees and place your hands on the thighs, tilting your torso forward to a 45-degree angle. After exhaling all of the air out of your system, keep the emptiness while you draw the belly back to the spine and lift upward, establishing Uddiyana Bandha. Still empty of breath, now allow your belly to flop out and in and out and in, up to about 10-15 repetitions. Then gently allow an inhale, and take a recovery breath before beginning another round. Start with four rounds and add on more as it becomes comfortable. This stimulates the internal organs, massaging them and moving fresh blood to dormant areas. 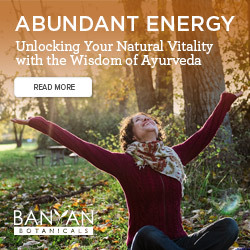 It also awakens an inner, energetic fire that can be used throughout the rest of your practice.Note: It is fairly safe for most body types, yet should be avoided if you are pregnant or on the first three days of your cycle. Hand Stand, Forearm Balance (Pincha Mayurasana), and Head Stand are known as the three heating Inversions. Backbends can be used as a heat-producing element in a practice. You need to warm up for backbends by doing some poses that open up the hip flexors and shoulders, and spending some time heating the smaller back muscles. Then, start with simple backbends, gradually moving into the ones that are more challenging for you. Note: Work on staying longer in backbends, maintaining smooth, even breathing. Longer holds in smaller backbends will bring more heat and a stronger spine than rushing into one big backbend held for a short amount of time. Refrain from drinking water during the practice. The water will cool the body’s temperature so try to hydrate before practice, and then drink a lot after. No matter which technique you choose, maintain Ujjayi breathing at a steady, even pace on both the inhale and exhale, throughout the whole practice. Ujjayi is a heated Pranayama that also helps us develop concentration and discipline. Remember that yoga works the inner body as well as the outer body, so as you practice, ensure that your inhale and exhale are the same length and elongated comfortably. This strengthens the diaphragm and internal organs while also toning your mind’s focus. The winter chill can tempt us away from our practice, and if we listen to that temptation, we are more prone to the sadness and low immunity that comes along with lower temperatures. Use your yoga practice as a means of caring for your whole well-being. Instead of feeling the contraction that comes from chilly weather, put on an extra layer of clothing, sip some hot water, and get to your mat, motivated by the chill to develop inner warmth. Who knows? You might end up falling in love with winter and its advantages, even into the slushy, muddy months.